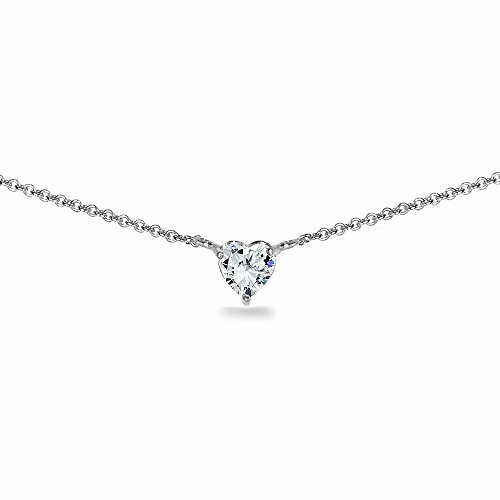 This beautiful necklace for women and teen girls features a 6mm heart stone made with Swarovski Zirconia. This dainty choker is crafted of fine sterling silver and is nickel & tarnish free. It secures with a spring-ring clasp and includes a 3'' extender. FEATURE - This beautiful necklace for women and teen girls features a 6mm heart stone made with Swarovski Zirconia. CRAFTED - This dainty choker is crafted of fine sterling silver and is nickel & tarnish free. It secures with a spring-ring clasp and includes a 3'' extender. PACKAGING - Jewelry is packaged ready for gifting. ABOUT - Swarovski Zirconia stones emulate brilliant jeweled rocks. Its radiance enhances the casual look and gives you glamour for the evening. Wear these jewelries to add flair to your romance and femininity.